As most of you know by now, on November 12th, the European Space Agency (ESA) landed a probe (Philae) on the surface of a comet (67P/Churyumov–Gerasimenko) as part of the Rosetta mission. However, perhaps some of you are unaware that NASA cut a strikingly similar mission (Comet Rendezvous Asteroid Flyby) due to budget constraints. NASA basically had to choose between two missions and picked the other one (the Cassini-Huygens mission to Saturn). That forgotten mission was scheduled to touch-down on the comet Kopff in 2001, and its cancellation left the ESA to grab first prize for a soft-landing on a comet. Critics of the ESA mission note that an unfortunate bounce left Philae to go silent (at least temporarily) thanks to coming to rest in partial shadow, preventing the solar panels from generating enough power to keep the batteries charged up. However, the lander had already collected and transmitted huge amounts of invaluable data. The mission is also a massive success in contrast with some other NASA efforts, such as the Mars Climate Orbiter mission that catastrophically crashed into the Red Planet in 1999, thanks to a misunderstanding over units. In fairness it should, however, be noted that the Cassini-Huygens mission that survived the budget cuts successfully achieved the first landing in the outer Solar System. But that was back in 2004. Old news. 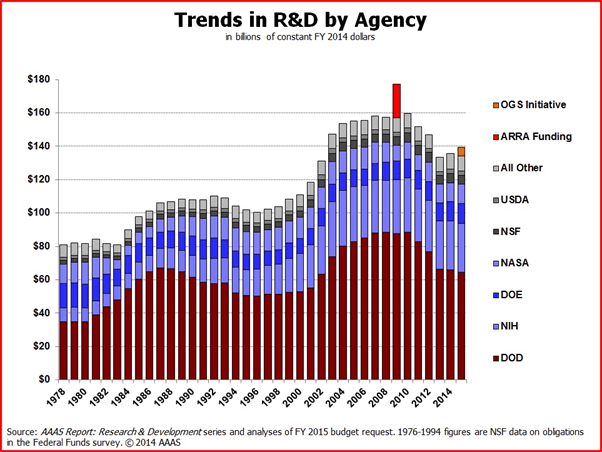 According to the American Association for the Advancement of Science , although total funding is higher now than it has been at any time prior to 2002 (in equivalent 2014 US Dollars), it is currently in decline. 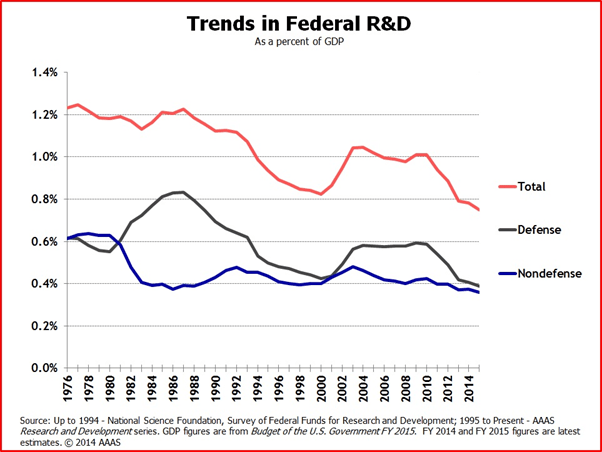 These levels are dominated by defence (‘defense’ in American) funding (around 50%) with increases in support for civilian research since the 1980’s driving mostly by funding to the National Institutes of Health (NIH). Moreover, both defence and non-defence funding has been in slow decline since the 1970’s as a proportion of the US’s GDP. Meanwhile the population grows and the number of scientists and science programs grows with it. This is only part of the problem, however. The College Board notes that, after inflation is taken into account, a 4-year public college education in the US costs 3.25 times as much as it did in 1984 (Figure 6; The College Board, 2014). Financial resources for families with children in college are simply not keeping up with this. Wages in particular haven’t increased since the 1970’s, once inflation is taken into account. The result is that over half of college drop-outs cite financial problems. Georgetown University’s Center on Education and the Workforce estimates that the US workforce will be short least 3 million college graduates by 2025 (Carnevale et al., 2010). So, what can be done to change this? How about a commitment to reducing CO2 emissions by 26-28% of 2005 levels by 2025, as President Obama declared on 11th November. OK – so it won’t put the US back in front in the Space Race, but a national commitment to new clean energy technologies could be just the ticket. Not only would money for development of the required technologies become available, but the required research and development should lead to new innovations and technologies that would spread widely beyond the initial applications in much the same way as efforts to reach the moon (and go beyond) spawned cordless tools and water filters. Jobs, technologies, American leadership potential, and a lower impact on the planet – who could say no to that? Apparently, the Republican leadership can. Not content with leading the least productive Congress in history, these ‘leaders’ are accusing the President of trying to kill jobs and the economy with this announcement. Without offering any proof for this suggestion, it seems that the Republican leadership simply has very little faith in American ingenuity and resourcefulness. This response is perhaps unsurprising. It is widely known that, over the last decade or so, a number of members of Congress have been undermining the credibility of scientists by repeatedly stating that they have been perpetuating a hoax on the American public by claiming that climate change is real and the consequence of human action. One such individual is Republican Senator Jim Inhofe, who typically suggests that it is arrogant to think that humans could be capable of changing what God is doing to the climate. He even wrote a book, published in 2012, called, “The Greatest Hoax: How the Global Warming Conspiracy Threatens Your Future.” He has also famously compared the Environmental Protection Agency to the Gestapo. Thanks to the fact that, in the recent 2014 Mid-term elections, “Americans… elected the party they like the least to run the government body they least trust.” Inhofe is widely expected to become the Chair of the Environment and Public Works Committee when the Republicans take control of the Senate next year. Climate science and environmental science more generally are likely to encounter increasing difficulties as a result. Attacks by politicians on scientists have not been limited to those working directly on climate change. Work by Prof. David Scholnick (Pacific University in Forest Grove, Oregon) to look at how resilient shrimp may be to changes in the ocean has been unjustly targeted by the Republican-led House of Representatives Science Committee in their investigations of wasteful spending of research funding by the National Science Foundation. Perpetuated by the media, such attacks further undermine the credibility of scientists in the eyes of the public. This makes it much easier to reduce science budgets unrelated to health research without too much complaint from the public. Thus, funding for such research is likely to fall further over at least the next few years. Wages for middle class families trying to send their children to college are unlikely to be rising any time soon, either. Returning to the subject of space exploration, President John F. Kennedy, at his 1962 speech at Rice University, said “We choose to go to the moon. We choose to go to the moon in this decade and do the other things, not because they are easy, but because they are hard, because that goal will serve to organize and measure the best of our energies and skills…” Unfortunately, the current Republican leadership seems to be much more intent on choosing to make things hard to do, rather than choosing to do hard things. As a result, American science may not yet be dead, but it does appear to be in need of life-support. 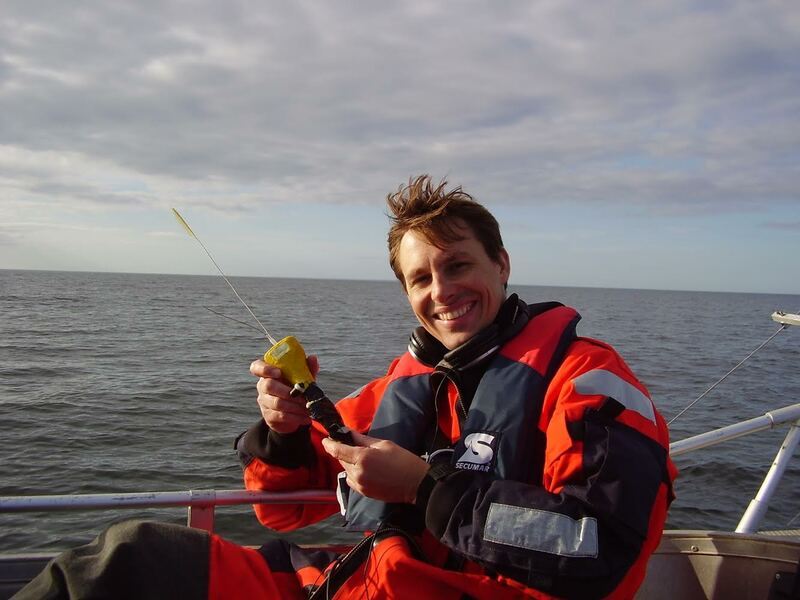 Tweets from the American Elasmobranch Society: President Ferry's plenary "Elasmobranchs in Biological Research"